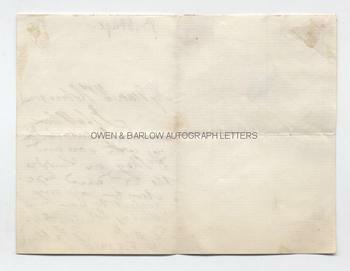 CHARLES BABBAGE autograph Letter Signed. British mathematician and inventor of the Difference Engine and the Analytical Engine. Credited as "the father of the computer". ALS. 1p plus integral blank leaf. Dorset St., Manchester Sq. 10th February, 1855. To "My dear Mrs Robinson". 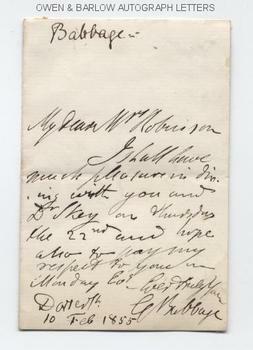 "I shall have much pleasure in dining with you and Dr. Skey [?] on Thursday the 22nd and hope also to pay my respects to you on Monday evening. 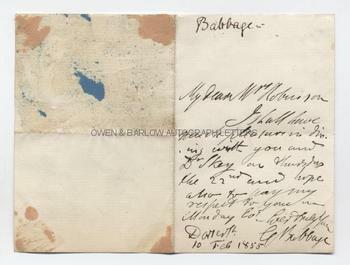 Ever truly yours, C. Babbage". 16mo. Approx 4.5 x 3.25 inches (11.5 x 7.75 cms). Mounting residue to verso of integral blank leaf. VG.